Just around the corner from the Dongdaemun Gate sits the Gwangjang night market in Seoul, Korea. Upstairs in the “real” shops it is all about fabrics and textiles. 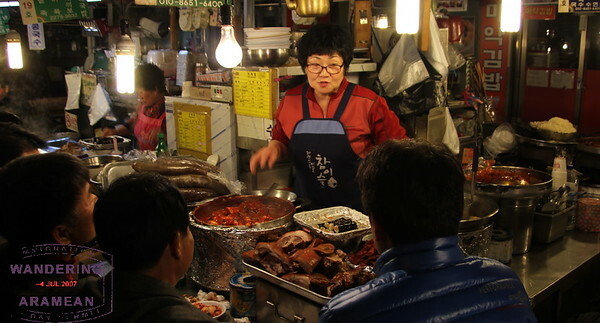 But on the street level, like many markets in Seoul, there is a Meokja-golmok (food alleyway). It is open at night, mostly for the folks working at the shops upstairs, but also for visitors like us. And this is, at least for me, the best type of night market: It is all about food. A couple blocks’ worth of stalls are set up under covered alley ways serving up fresh-cooked noodles & dumplings, meats & seafood, soups and more. There was steam rising out from each of the miniscule kitchens as we strolled up and down the way, surveying the shops and trying to find three seats; even relatively late the crowd was rather large and many of the restaurants were full. Given a general lack of language skills our efforts mostly consisted of pointing and hoping for the best; even with the couple shops offering English menus the options listed did not really provide a ton of details about what we could expect from the general categories of dumplings and meats. And so we settled in on one of the heated benches, pointed at some options on the menu and cast our lot into the hands of the woman behind the counter. I’m pretty sure we won. We chose one of the soup shops. We mostly wanted a light meal as it was our first night in town and we were also pretty tired, looking to eat and sleep in reasonably quick succession. Also, those were the shops where we could reasonably recognize the options being served and where we could get a seat. Given a choice of noodles, dumplings or noodles & dumplings (like I said, not a ton of detail in the menu translations) we went for the combo and then watched as our host went to work. The noodles were hand-pulled (Kal-guksu), cut and cooked to order. The broth was a bit bland, I think on purpose, but there were spices available to kick it up a notch or three. And the noodles were delicious. A local couple sitting at the counter with us made fun of my chopsticks skills, which is only mildly disappointing as I thought I was doing pretty well. And then, about $3-5 later, we set off from the counter to wander a bit more and see what trouble we could get in to before collapsing exhausted from jet lag. Quite cheap and reasonably tasty. Not the best meal we had in town but that’s because I’m a sucker for the Korean BBQ thing far more than I probably should be. Definitely a good snack before a good night’s sleep. As for the large crowds at night, it turns out that is partly caused by the location of the market. It is adjacent to what I’ve been told is one of the world’s largest fabric & textiles markets. The market keeps overnight hours to facilitate working with customers around the world and the workers need somewhere to eat when they can sneak away for a bit. 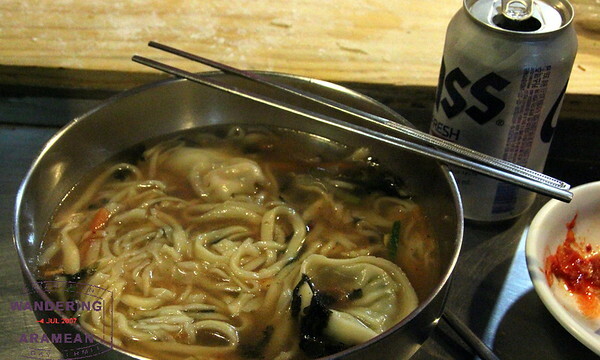 Kalguksu shouldn’t be bland, but it also depends on what your palate is used to. “Kal” means knife and “guksu” is noodle. I believe it’s typically flavored with anchovies and kelp (what I also use when making a basic udon broth) and some salt. Preparation is generally pretty plain, but I also usually see it with chopped green onions, and people will put in some ground black pepper, red pepper, maybe some sliced meat, and veggies before eating. Goes great with kimchi. Makes sense with the name. And there were plenty of things available on the counter for us to season the soup so it ended up being pretty good. Plus, the experience was spectacular.